Hope you are having a great Labor day weekend and enjoying the outdoors on this unofficial end to summer. I got to enjoy my husbands first high school football game of the season, a long run, time at the pool, and dinner and drinks outside. And how many of you were excited college football started this week? And kickoff for the NFL is so soon! We sure are excited to have football on TV at our house because that means weekend hangouts with friends and great food. Usually on Saturdays we’ll make a variety of appetizers in the afternoon and eat them throughout the day while watching football. 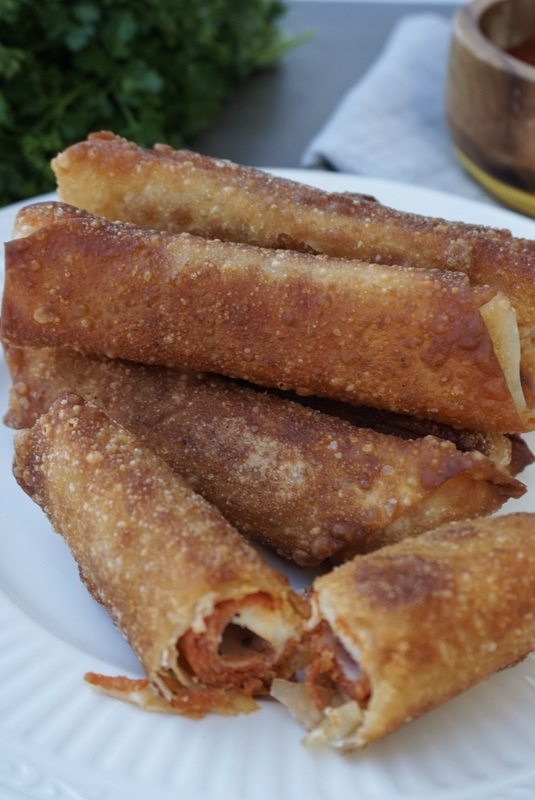 One of my favorite appetizers to make is traditional cheese and pepperoni pizza logs. They are so easy and incredibly delicious! 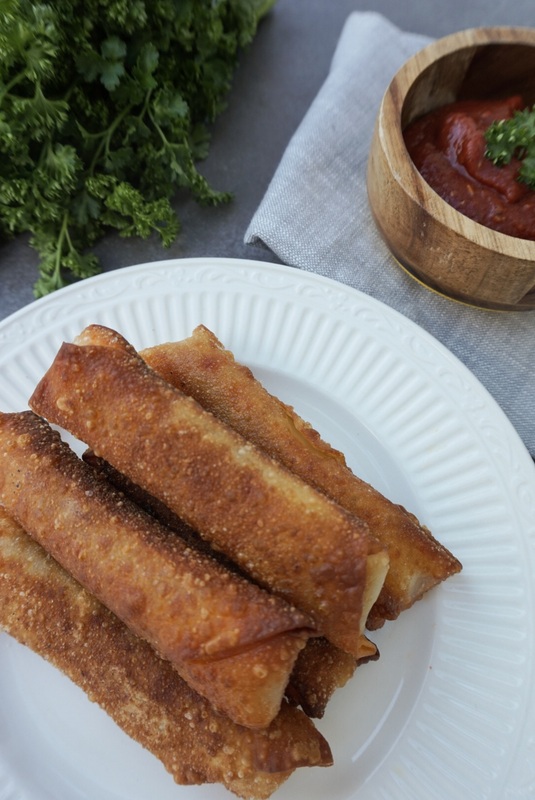 My husband was raised in western NY and he claims these are a Buffalo food, and I guess I believe him because the first time I had them, and the only time I saw pizza logs on a menu at a restaurant was when we were dining out in Buffalo. After eating them I immediately started figuring out how to recreate the recipe at home. 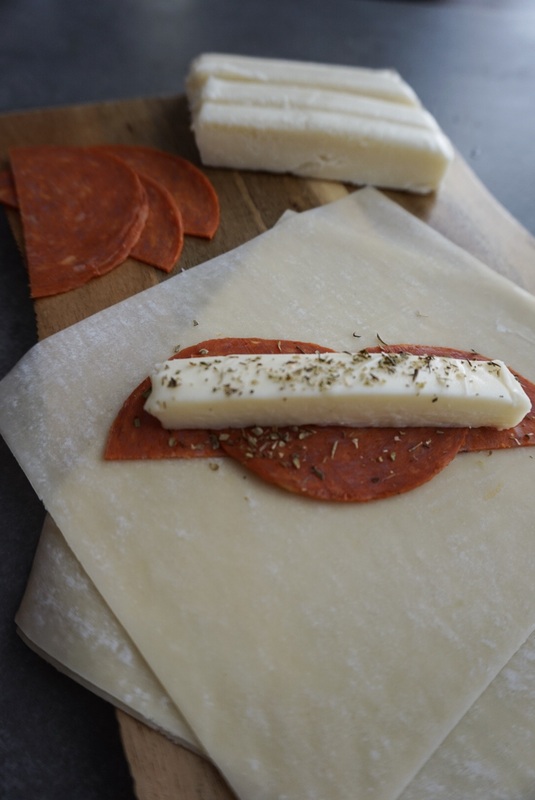 When I make these pizza logs I usually use Turkey pepperoni because it has about 70% less fat than regular. Or my favorite regular pepperoni brand Applegate. The Applegate pepperoni slices are just larger, so I need to cut them in half, see below. Once you have all the ingredients ready, start with an egg roll wrapper with one of the points facing towards you, so it’s in a diamond shape. I lay out about 4 pepperoni slices overlapping them a little. Then I cut half of a mozzarella cheese stick or slice from a ball and place it on top of the pepperoni slices. And season with oregano. 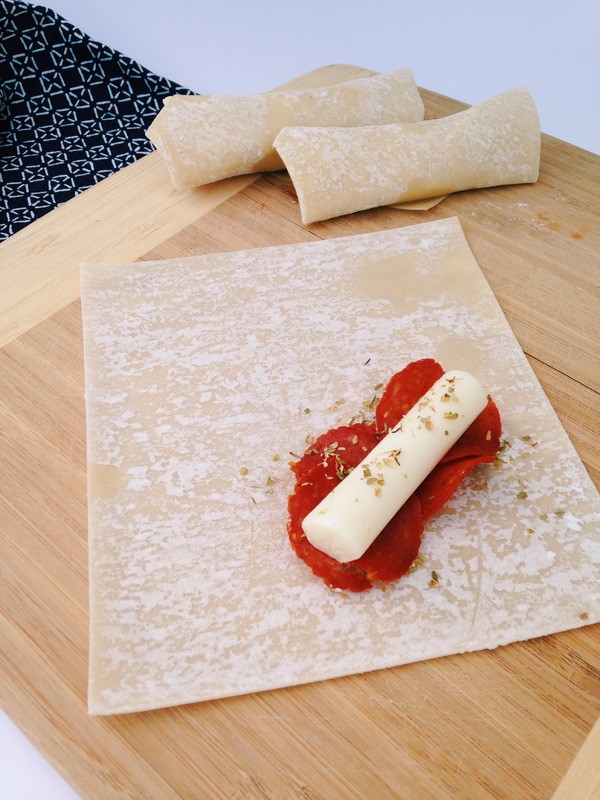 When folding the wrapper, fold the side ends in first, and then wrap the point towards you around the cheese. Use a dab of water to ‘glue’ the wrapper together. When cooking the logs there are several different ways you could do it. To get them the crispiest, you want to fry in about 1 inch of canola or peanut oil. However I like to try to save some fat and calories and just lightly crisp them them in about 1 tbsp canola or olive oil, turning the logs every 30 seconds to 1 minute. You could also bake the logs after you brush them with a bit of olive oil for the healthiest cooking method. Once the logs are cooked you just serve them with some pizza sauce for dipping. I usually put the pizza sauce in a mini crockpot and keep it on warm when serving at a party. Hope you enjoy this easy game day appetizer. Let me know if you try it! And tell me what your favorite football food is in the comments below! Thank You for sharing ! These look so delicious! Will try soon !!! Miss seeing you at Stoddert ! But understand Hope you are happy we’re you went ? I miss everyone so much! Let me know if you try them. They are great a great alternative to pizza! OMG the boys will love them! So easy and different way to eat pizza. Yes orignal pizza logs were invented in Buffalo! We can buy them in grocery stores here and bake in oven but I never made from scratch! I will be now! 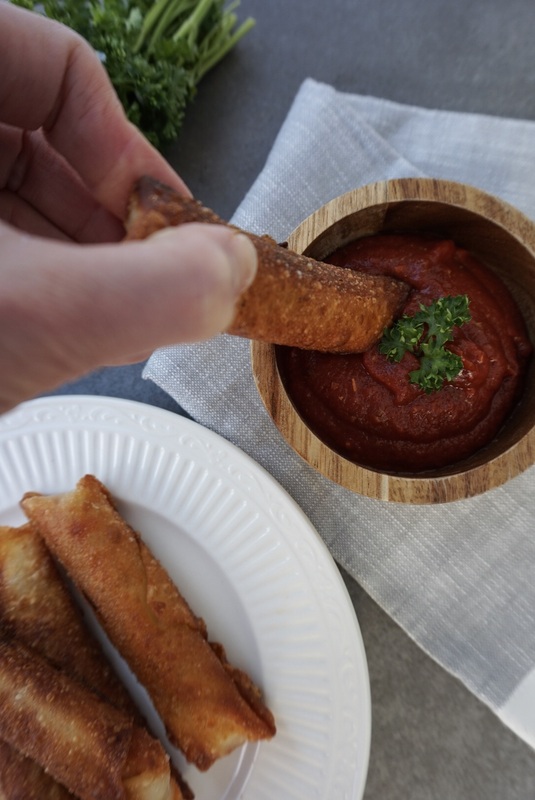 Only difference is the original pizza logs have alittle sauce inside. I may add that. OH what a great idea to all the sauce on the inside! Yes, my husband is always raving about different food from the Buffalo area. We try to recreate a lot of it at home. I grew up in Western NY…they are originally from there in the 80’s! I now make and serve them on my Food Truck in Maryland. Eat sellers….also make them with Taco Filling. Mmmm!! Oh a taco filling is such a good idea! We cook the taco meat with seasoning (homemade), and use sharp cheddar cut into a ‘finger’ length and thickness. then add minced onions and salsa. For dipping sauce, melted cheddar cheese or again, salsa. Commercial egg roll wrappers are bigger than grocery store wrappers so more filling can be put in. Yum! Another filling choice we use is Buffalo Chicken. Cook chopped chicken breast in a pan with butter. Add Franks Hot Sauce and let it simmer. 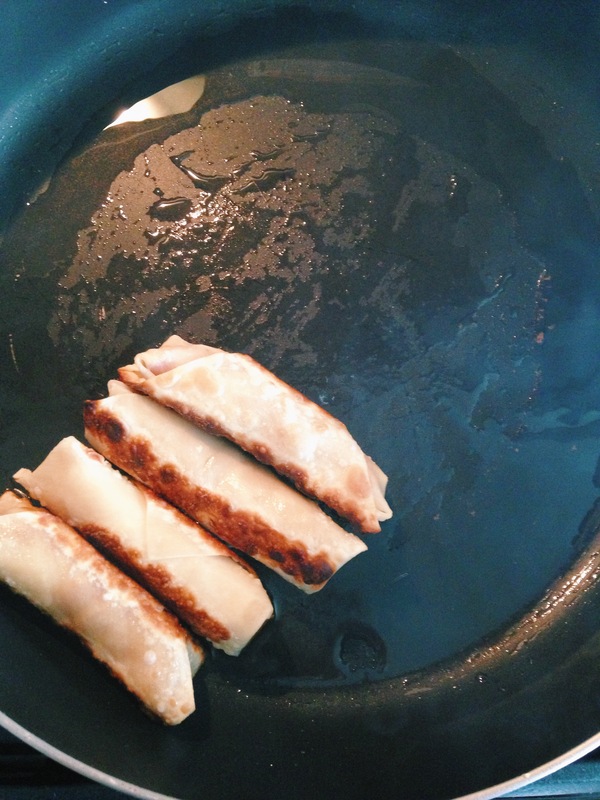 When cool, add to egg roll wrapper with mozzarella cheese. dip into blue cheese or ranch dressing after cooking is done. YUM! Yes I’ve done them with buffalo chicken, so good! Thanks for sharing, can’t wait to try these.